YouSeeMe is the first e-wallet that combines payment and trading functions. Now you can share with friends and family, pay for purchases, exchange traditional cryptocurrency and assets and goods, and keep all your assets in a safe place. This project combines two applications at once. This application is YouSeeMe and the Bartwallet application. 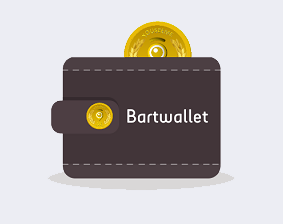 The Bartwallet application will be launched in the first quarter of 2019 and will offer a new generation of trading solutions for cryptocurrency and tokens. This exchange will support Bitcoin and Ethereum (which will appear after other cryptocurrency), as well as Bartcoin (BARC). The exchange platform will offer high liquidity, transparent order books and low and fixed costs for all transactions. This application can be installed on all types of smartphones. Bartcoin (BARC) is a protocol based on Ethereum Blockchain (ERC20), where retailers can value customers for various behaviors, such as spending money in their store and getting information exchanged with Bartcoin. Then buyers can spend their Bartcoin tokens on all traders on the network for future purchases or exchange them on the Bartwallet platform. The Youseeme application facilitates the transition between the virtual world and the real world, allowing you to spend money on Bartwallet thanks to Bartcoin cryptocurrency, for example, you can change Bitcoin, Ethereum or other Bartcoin cryptocurrency and pay for purchases through Youseeme in a shopping shop, restaurant …) with a few clicks mouse, you can easily track the history of all your transactions on the Internet. Make a purchase and payment through Yousseme eWallet, no need to use a credit card. Share your taxi fare with your friends, or just send a portion of your rent to your roommate, all with the help of the Youseeme app. Buy and sell your cryptocurrency, wherever you are, collect transactions and decide to change them directly to Bartcoin or Euro. Always available, see Bartwallet’s transaction history and management 24 hours a day. Wallet cryptocurrency now offers asset and commodity trading. Transaction control regulations are currently applied by regulators around the world. They can be included in the electronic money license required for DSP2 rules. The fact is that Blockchain’s technology and tokenization is not limited to the financial sector. Blockchain has opened new words to explore creative business thinking. The Youseeme exchange allows businesses and entrepreneurs to pay and receive BARTCOIN (personal virtual currency), thereby increasing sales to new customers locally and globally. The BARTCOIN economy is based on a network of traders and consumers who form communities. We provide stable and stable buyers and sellers of currency to conduct daily business transactions at very low prices. Economy BARTCOIN also provides access to the digital currency market through individual investments in the Blockchain network. We strive to ensure that economical surpluses are convenient for users and ensure safety and values. YouSeeMe and Bartwallet will help. You don’t even need to use a credit card. Now you can make purchases and pay for it through YouSeeMe e-wallet, pay for trips, rent a place, buy and sell your cryptocurrency, wherever you are, you can exchange it directly with Bartcoin or Euro anytime. Now everything is always available and ready, and you can manage Bartwallet 24 hours a day. UCME is a Tokenised Marketplace pioneer and community concept for consumers and businesses worldwide. This allows you to fully decentralize commercial relationships between companies and users based on proximity and offer a user-friendly, new and unique communication and payment model. Octave-UCME has its own FIAT and CRYPTOCURRENCIES payment platform. This allows the use of traditional payments and transactions using electronic wallets for next generation mobile trading applications. We own and manage two mobile applications. Youseeme, a market that uses eWallet to trade goods and services, and Bartwallet, a trading platform application specifically designed for digital currency trading. YouSeeMe and Bartwallet will be useful helpers. You don’t even need to use a credit card. Now you can make purchases and pay for it through YouSeeMe e-wallet, pay for trips, rent places, buy and sell your cryptocurrency, wherever you are, you can exchange it directly with Bartcoin or Euro anytime. Now everything is always available and ready, and you can manage Bartwallet 24 hours a day. In conclusion, I would like to say that such a project has every opportunity to succeed in the crypto community and bring benefits to its investors in the near future. Who offers the best service in building a Bitcoin Trading Software Script?